Come Join the EAA team at the next Annual Mayor's Clean and Green. What a good time to keep the Earth clean, Earth Day. We will meet at the EAA office, work in teams and go out and clean the community. 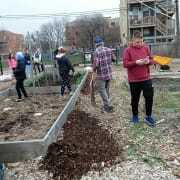 EAA also participates in a community garden and we will begin the prep for the land. the products raised in the community garden are used for our food pantry.